Your safety & satisfaction is never left to chance! 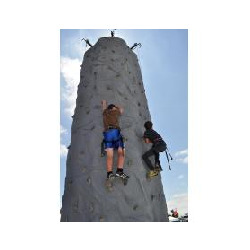 Jubilee Jumps brings the excitement of rock-climbing to your next event. People of all ages can enjoy the thrill of climbing up the wall even if they have no climbing experience. The climber begins an ascent up the wall, and at the summit the climber simply pushes off the wall to be lowered slowly and safely through the air, courtesy of the wall's redundant autobelay system. The wall is 24 feet tall and can accommodate 3 climbers at a time. The wall requires a 10'x16' area and setup time is approximately 15 minutes. The wall is always supervised by our trained staff. Each climber is harnessed and attached to a redundant safety device. Your safety & satisfaction is our #1 goal! With years in the party rental business, we can help you successfully plan your next event! We are fully insured and can provide you with additional insured certificates if necessary. This unit is not available for online booking. Please call 415-889-5781 to make your reservation.